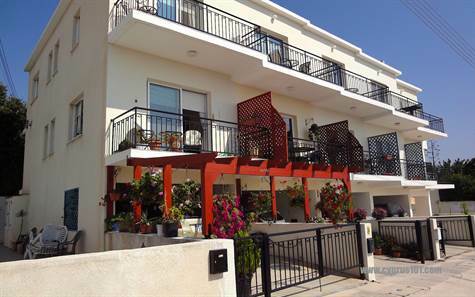 Cyprus Property Blog by Cleo : Spacious Mesa Chorio Townhouse with Sea Views & Deeds - Improved Price! Paphos, Cyprus - This spacious end townhouse is located in a quiet cul-de-sac in the village of Mesa Chorio, which enjoys both the charms of the typical Cypriot village and tranquil rural setting, with the convenience of Paphos town which is a few minute’s drive away. The village benefits from breathtaking elevated and unobstructed panoramic sea views.